President of Association "For Sustainable Human Development"
Karine Danielyan, assoc. prof. of Yerevan State University, Pres. of Association "For Sustainable Human Development", National Expert of UNDP and UNEP, Independent expert of Parliament of RA. In Armenia has been developed an own variant of Sustainable Development Criteria (or according to the interpretation of UNDP — criteria of Sustainable Human Development; judging from the last publications of UN structures, these two conceptions are drawing nearer to identity) . · UN Structures shall elaborate recommendations in order to harmonize the development of the system of indicators at national, regional and international levels. To our opinion, the Human Development Index, used by UNDP, should be supplemented by the "social indicator" (e.g. the population poverty index, which has been developed by UNDP and presented in the Human Development Report for 1997), and the "integral environmental indicator". The obtained variant will be the most appropriate one among the existing quantitative evaluations of the situation in a country from the point of view of Sustainable Development. On demand of UNDP representative office in Armenia, such technique was developed by us in 1995. 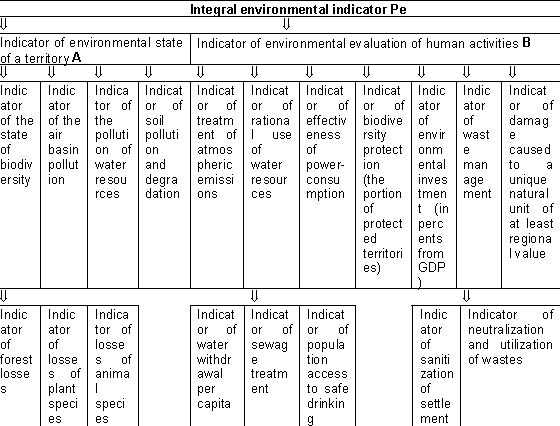 Integral environmental indicator Pe is formed by two generalized indicators: the indicator of environmental state of a territory (A) and the indicator of environmental evaluation of human activities (B); in general, Pe is formed on the base of 21 environmental indicators (formula 1, chart 1). Pe = (A + B)/2 = (- SumAs /4 - SumBs /4 + SumBt /2 – B7) /2, where s varies from 1 to 4 and t – from 5 to 6 (1). With consideration of the given forth constituent (SHDI = HDI + Pe) the Human Development Index may already be qualified as Sustainable Human Development Index. The scale of countries, ranged according to SHDI, will undergo considerable changes in comparison with the one, based on the rating according to HDI, depending on the degree of rational use of natural resources. This technique has been successfully approved by us basing on the statistical material of Armenia (Pe = - 0,427, SHDI = 0,404) and Georgia (Pe = - 0,237, SHDI = 0,592). The evaluation has been carried out on the base of the data of 1990 (the year was chosen as the most stable and provided with statistics within the last period of time). Thus, Armenia outstripped Georgia in the scale elaborated by UNDP on the base of HDI, while taking into consideration the environmental indicator the countries exchange their places. To certain extent it can be asserted that Pe makes it possible to evaluate the portion of the contribution made by countries into the general environmental degradation on the planet. Thus, Pe of Armenia, which is equal to 0,427 (the limits are 0 and 1) may indicate the following: the country is included into the group of countries, whose environmental characteristic is entirely adequate to the general situation on the Earth and almost does not diverge for either the better or the worst. In 1998 the State Committee of Statistics of RA implemented our technique for evaluating the situation of 1997. The result is presented in the National Human Development Report of 1998. According to official estimations, Pe has turned out to be equal to 0,323. However, to our opinion, some of the basic data were artificially "improved". According to our somewhat updated estimations, the Pe of 1997 makes up 0,345 (table 1, our updated estimations are indicated in brackets). The obtained results demonstrate that the characteristic of the environmental situation in RA was a little more favorable in 1997 in comparison with that of 1990. However, as has been already mentioned above, this is connected with abeyance of the industry and reduction of agricultural production, and not with implementation of technologies on environmental protection and resource saving. It would be desirable to approve the elaborated method basing on the statistical data of other countries (in particular the CIS countries), which would make it possible to evaluate the situation from the same position with implementation of a rather adequate system of parameters. We presented this technique to the headquarters of UNDP in New York and have received in general a positive evaluation from the expert group on elaboration of indicators. The main remark was the complexity of estimations, although the method uses solely the statistics, which is generally accepted in the world practice, and a mathematical apparatus of by no means high complexity. If necessary, the calculation system may be simplified. Table 1. 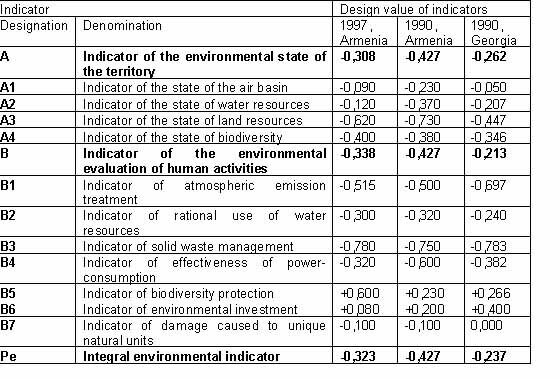 Comparative characteristics of environmental indicator components for the data of Armenia (1990, 1997) and Georgia (1990). 1. K. Danielyian (main executor and head of project), L.Valesyan, Yu Pogosyan, K. Oganesyan and oth. Report of the UNDP Project entitled ‘’ Transformation of the Human Development Index into the Sustainable Human Development Index", Yerevan, UNDP, 1995. 2. K. Danielyan. The Conversion of the Human Development Index (HDI) into the Sustainable Human Development Index (SHDI) (box) // Armenia. Human Development Report, UNDP, Yerevan, 1996. 3. Yu. Poghossyian. The impact of the environmental factor on Human Development Index HDI). Human Development Report, Armenia /Annex 111/. UNDP, Yerevan, 1998.